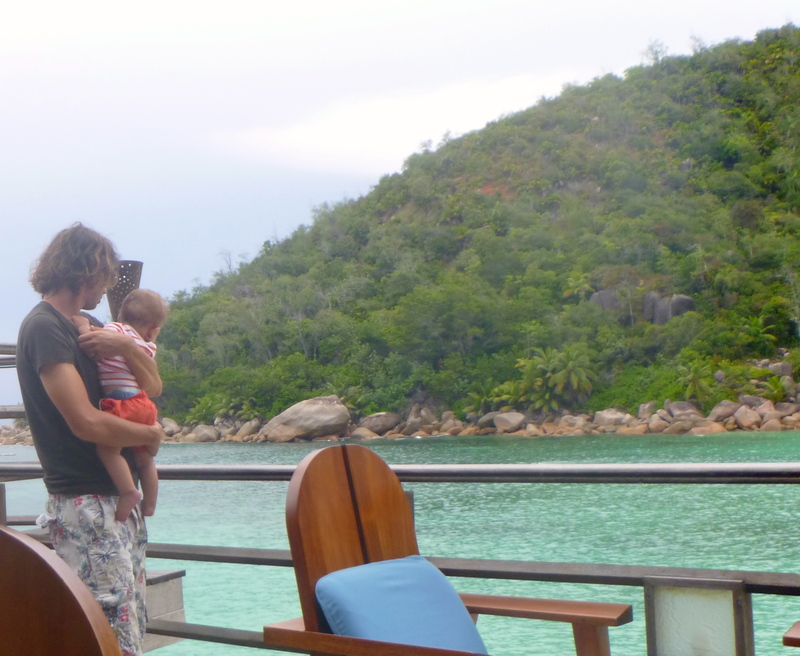 I took the plunge and got a place of my own……..I’ve moved my little blog to seychellesmama.com I hope you will continue to follow my happenings over there! Last week was my 28th birthday! I was treated to a lie in as Arthur had gone for a sleepover at my Mum and Dad’s apartment. I say lie in but we are talking 7am, yes that is a lie in for me, sad isn’t it!! My present from Mark this year was my PADI advanced divers course, i’ll talk about that in a separate post! Mum and dad got me a pretty play suit and an iPad mini and my brother got me a lovely case for it. Daddy Arthur got me some earrings I had my eye on! So I had been suitably spoiled! 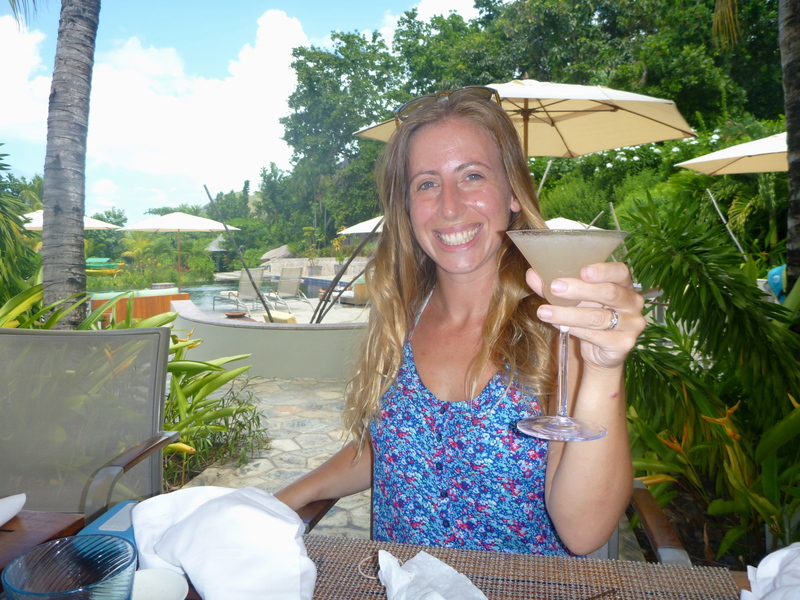 We then went out to a mystery location for my birthday lunch which turned out to be Raffles! I had been wanting to go for ages so I was delighted when we pulled up! We went to the pool bar it was gorgeous! The waiter asked if we lived here……What!? Don’t we look like we belong in Raffles, what gave us away???! We had a starter of Sushi and a mixed platter with things like samosas and mozzarella sticks….yum! For lunch my dad had a smoked Marlin wrap which he said was delicious but honestly I think he made a bit of an error because the rest of us had the burger and it was the best……….I’m not talking any burger here though this was a Wagyu burger. I can now write this like I know what I’m talking about, I don’t, but I looked it up and apparently it means something along the lines of the cow was fed Beer and Sake and it gets regularly massaged, lucky cow! So anyway the burger tasted awesome, it was massive and cooked how I wanted and it came with chips, what more could a girl want on her birthday? Cocktail and burger, they don’t come classier then me! Oh right, yeah, cocktails of course!! It’s kind of obligatory to have some kind of ‘sling’ cocktail since it was Raffles who invented the Singapore Sling (the Raffles in Singapore obviously!). I went for the Paris sling, but I of course also tried my Mum’s Singapore sling, oh and we had to have a Margarita, it’s kind of our thing! After lunch it was swim time. Where we had so much fun splashing around (only partly cocktail induced), jumping in-between the two layers of infinity pools, making a built in sun bed thing into a slide. Arthur slept until Mark decided to do a bomb into the pool!! At around 4 it all clouded over and the heavens opened, we took it as our cue to leave! The evening was spent having sandwiches and a big yummy birthday cake! All in all it was an awesome day! I’m back from being a little MIA and it’s time to link up with Katie again for this weeks Ordinary Moments. You may have read my first Ordinary Moments post about our Skype family get togethers. Well, we’ve had a month of real life family time with my mum and dad being here and it was amazing. I went to meet them at the airport with Arthur and he definitely didn’t act like he was meeting strangers so I really do think all that skype time helped!! It was so lovely to see Arthur get to know my mum and dad and for them to get to know him. These moments became ‘ordinary’ for a month but we all enjoyed every second as unfortunately it’s not always the case! Of course they spoiled Arthur rotten and he absolutely loved all the fuss that was made of him, he became really close with them. It was the first time I have seen him be like that with anyone outside of me and Mark. He was so relaxed around them. Having them here was really good for me too, it made me relax. At the same time Mark was off work for Easter holidays so for me it was amazing having all that help with Arthur when usually it’s just me while Mark is working. We had loads of time swimming, being at the beach, BBQing and just generally spending good time together. They left on Friday Morning and we’ve already had a quick video chat! We are going to the UK in the summer and I already can’t wait, I know they can’t wait either! It’s been a little while but it’s Seychelles Time again! La Digue is the third most populated island in the Seychelles. From Praslin it is a 15 minute ferry trip. 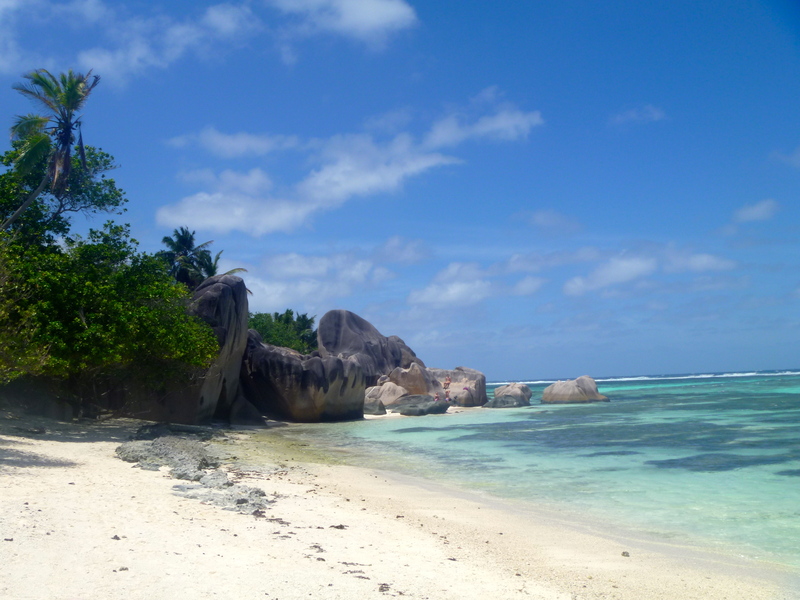 Going to La Digue really is like going back in time, its so quiet and life is slow there! We recently took Arthur for the first time with Mum and Dad. 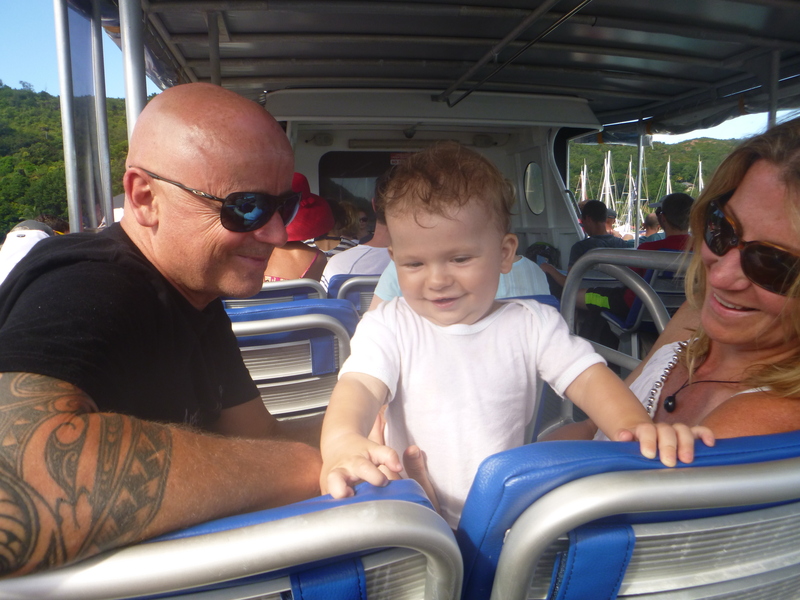 This was Arthur’s first time on a boat, he was really good and loved looking overboard, particularly at the boats wake. La Digue is a Awesome place to hire bikes, its the best way to get around the island and its really safe as there are hardly any cars at all. We decided not to this time as we wanted to be able to keep Arthur in the shade so the push chair was the best for that. We walked around the North side of the island which is nice and quiet, a really beautiful walk. 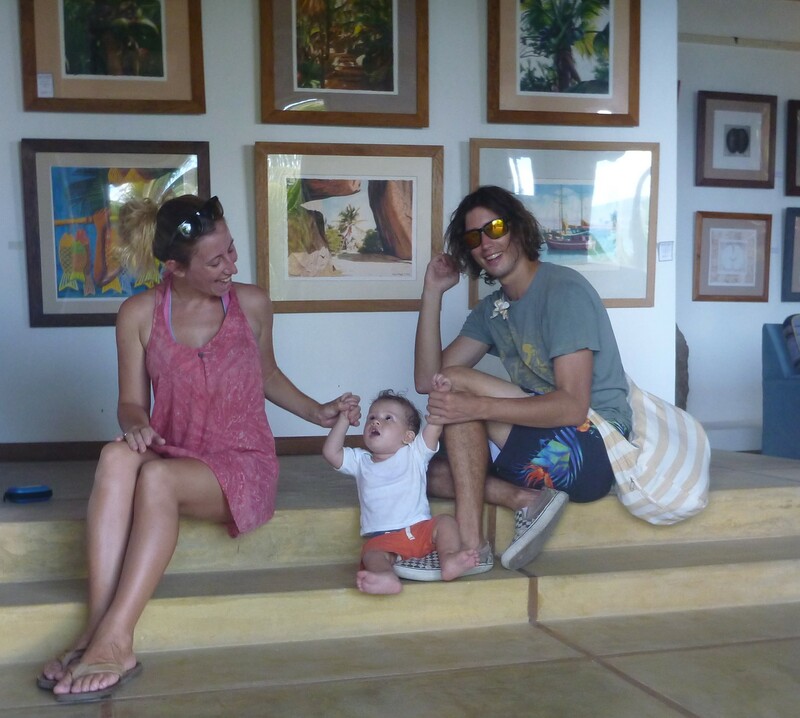 We followed the road around to the George Camile gallery, Arthur had lots of fun crawling around there, although I think thats more due to the fact the floor was nice and cool rather than him being particularly interested in the art! To be honest he kinda took over the place!!! 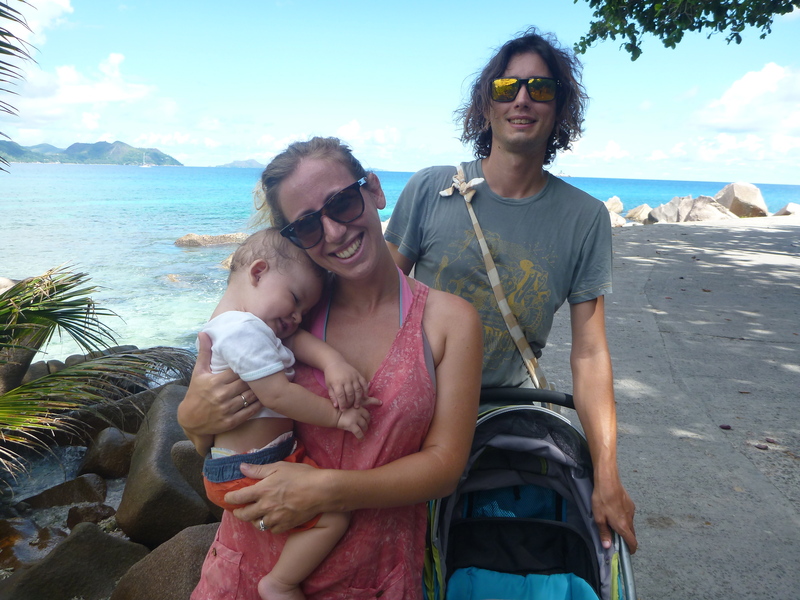 This time we didn’t walk round to the Coconut plantation where the gorgeous Anse Source d’Argent beach is as it was a little far to go without bikes and plus the walk around the North coast took us longer than expected! Anyway here is a picture from a previous trip as its really pretty so you might want to see 🙂 It’s in the National Geographic top 10 beaches in the world so it can’t be half bad right!! So thats it for now! 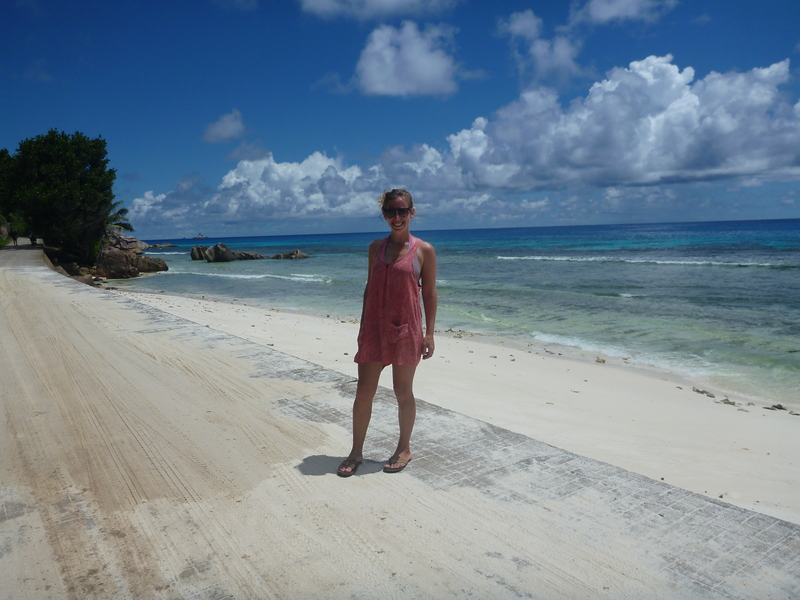 Hope you enjoyed a little bit of Seychelles time, see you next time! So I’m sorry as I’m sure everyone is totally over Mother’s Day by now but I haven’t had chance to write about mine yet, and it was my first one so I’ve gotta get it written down! As far as I can gather Mother’s Day isn’t celebrated in Seychelles. If it is there is certainly no big deal made of it and no holidays here are commercialised like they are everywhere else I’ve been! There are no special mothers day cards, gifts etc! Despite it not being a big deal here its something we still celebrated and I was lucky enough to have my mum and dad here too so we could all celebrate together! 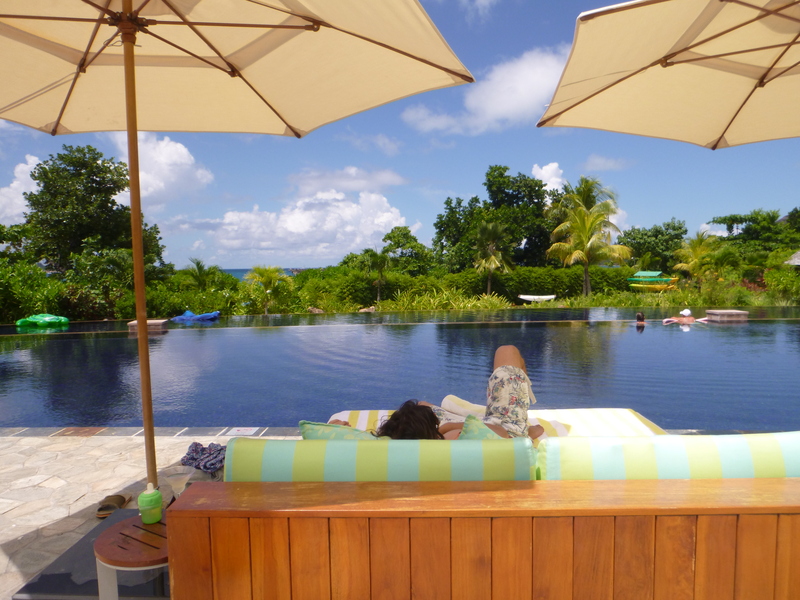 On Saturday, Mum and I went to the gorgeous Waterfront Spa at the Black Parrot Suites in the Coco de Mer Hotel. The view from the treatment room is absolutely amazing, we both had the ‘Signature Scrub’ which was made up of honey, sugar and orange. After the scrub you have a shower which looks right out onto the Ocean its so so beautiful I didn’t want to get out. That’s followed by a massage using an oil that is suited to your “element”. Apparently I’m fire….that didn’t surprise anyone too much!!! I didn’t take any pictures there, but here is one from their website. 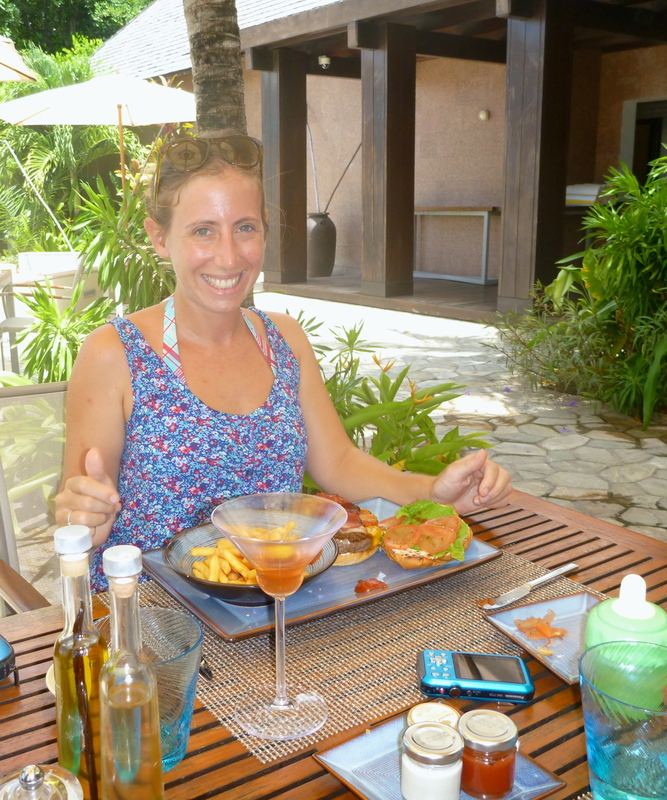 On the Sunday we all had a lovely day when we went for Lunch at the Beach Bar and Grill in the Constance Lemuria Hotel. It’s a gorgeous place to have lunch. It is built into the rocks and overlooks the beach, the food was absolutely incredible. Dad treated us all to a lovely bottle of champagne! 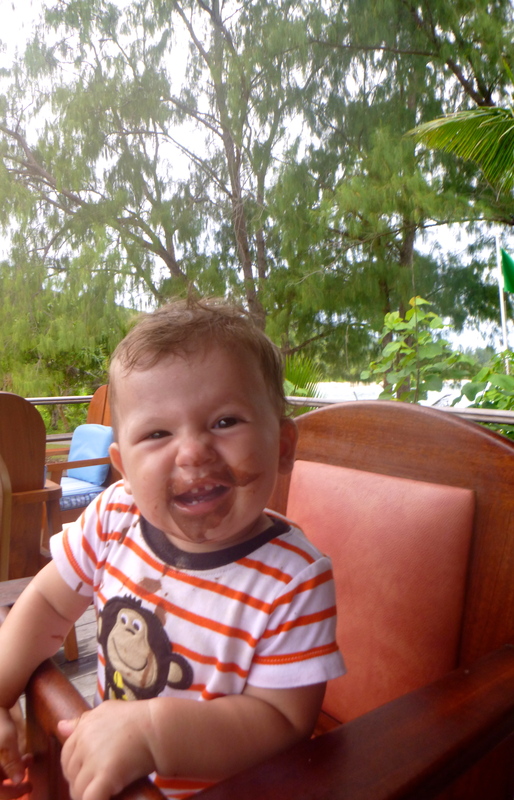 Arthur had a little bit of everyones food but mostly he loved the chocolate Ice cream!!! We went onto the beach and had a swim afterwards. The weather was pretty overcast and in the morning we had some pretty epic thunder which was really needed to break up some of the humidity! My mum is a big lover of storms so she loved it! Arthur’s little Billabong swim/sun suit is so cute. Mum and Dad brought it out for him, we’ve been getting lots of use out of it already, he seems really happy and comfy in it too! So that was my mothers day weekend, I loved it! I hope you all had a lovely time with your families! I’m a little bit late with this one, but my little guy is now 9 months old!! I’ve loved this month with Arthur. He has really become such a funny little guy and is really coming into his own. Crawling is well and truly weighed off now and he’s becoming pretty confident with walking along holding onto the table, sofa or whatever he can! He has got my mum and dad here at the moment and he’s absolutely loving it, when we met them at the airport he was so smiley straight away, I really think all those Skype conversations have helped him with that! Arthur has said “dada” a few times now which is really exciting! Not particularly aimed at Mark or anyone really but it’s great he’s started to make the sound! He’s really becoming quite the chatterbox and loves ‘singing along to any song but old McDonald and the wheels on the bus seem to be the favourites at the moment. We have had more and more time outside with Arthur this month. We’ve had a first proper successful ocean swims with him and although he’s not as confident as he is in the pool he seems to be enjoying it! He is now sleeping through the night, hurrah!! Waking up at around 5 usually although we have had some earlier wake ups which is no fun!! 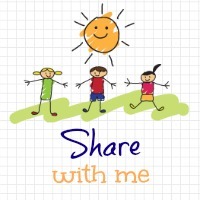 Just wanted to do a quick little post to acknowledge that I am a little MIA here at the moment! We are having a lovely time with my parents being here, Arthur is loving spending time with them and they are of course loving every second with him! Mark has been working this week so in the mornings once he goes I have been off up to where they are staying and spending the whole day together. Arthur’s been spoiled rotten and we have already had some fun times swimming! As of Thursday Mark finishes for Easter holidays and he will have three weeks off so we can do lots of fun things together. On Friday I’m booked in for a dive with my mum and dad which will be amazing as the last times they have been here I have been pregnant/first few weeks after having Arthur so it will be great to finally be able to go together. On Saturday Mum and I are booked into a spa for our Mothers day treat which will be lovely! I’ll try to make sure I don’t go totally off the radar and keep in touch about our nice family times! 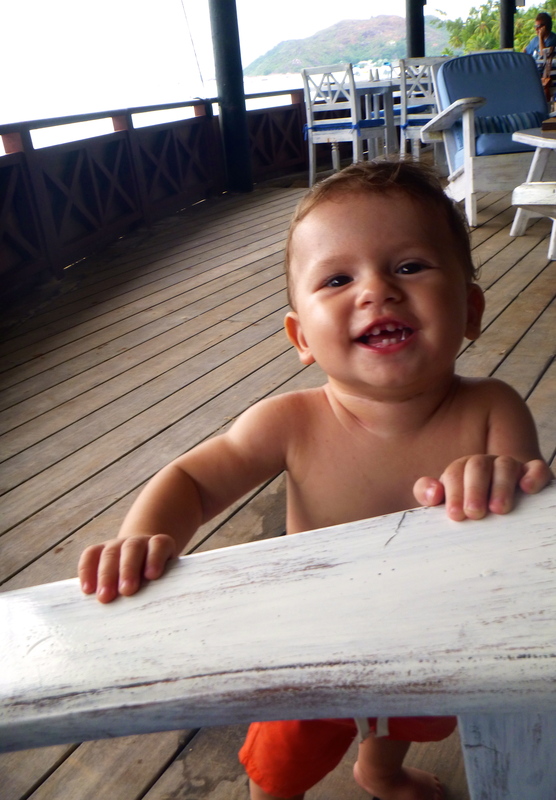 All content on this blog belongs to Seychellesmama unless stated otherwise. Please do not copy save or use this without my permission. Copyright 2014.